Starring Sam Claflin, Paul Bettany, Asa Butterfield, Stephen Graham, Toby Jones, Tom Sturridge, Robert Glenister and Miles Jupp. In France in 1918, a group of soldiers under the command of a disintegrating officer, are given a mission by their Colonel which they’re told will help bring about the end of World War I. The days count down as they await their fate. R C Sherriff’s WWI play, Journey’s End, first saw the light of day back in 1928. Since then, it’s become a novel and has made it onto the screen a number of times, although its last big screen outing was in 1930. 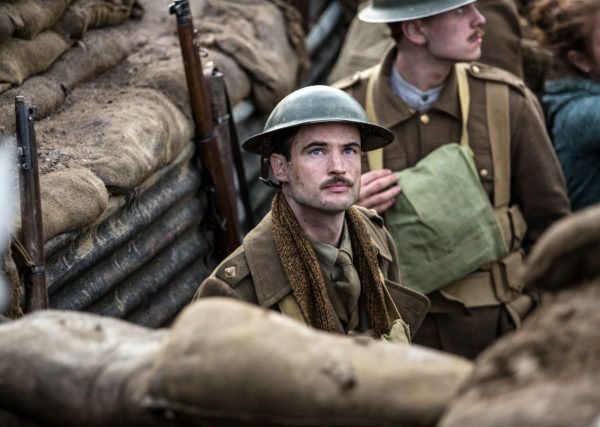 In the year that marks the centenary of the end of the First World War, it’s back in cinemas in a new version with a powerful British cast. The claustrophobic setting is a trench on the front line in France. Soldiers all take their turn there, six days on the trot, whatever they may bring. As the days tick away, one particular group of soldiers are given a mission by their Colonel: a select handful have to go over the top in a raid to bring back a German prisoner. It’s a mission nobody wants, but they all know that somebody will have to do it. Sherriff’s treatise on the brutality and futility of war has lost little, if any, of its original impact and director Saul Dibb (Suite Francaise) gives us a serious, sombre and deeply moving film, one that takes no prisoners. The cost is terrible. It re-creates the gloom and mud of the trenches to such an extent that you can almost inhale the stench but, most of all, you can touch and smell the fear that slowly builds towards the day of the raid. And the clock ticks loudly by showing each date on the screen. 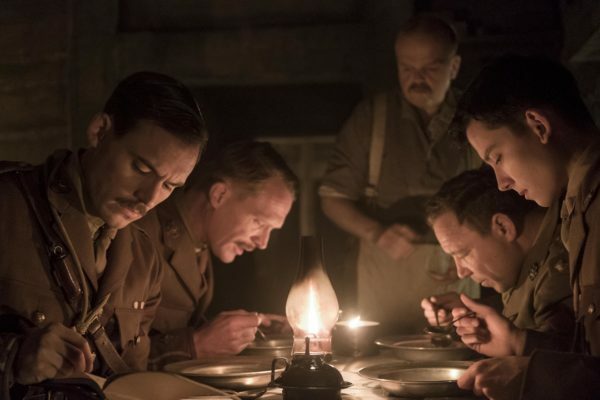 What the soldiers have to face is bad enough, but the situation inside the trench bristles with tension, mainly because of the unpredictable Captain Stanhope (Sam Claflin), who is slowly buckling under the pressure of looking after his men. He puts on a good enough public show, encouraging them with a few well-chosen words, but he’s fooling nobody. His volatile temper and love of whisky are common knowledge. It’s easily Claflin’s best performance to date, showing what he can do when he’s given something he can get his teeth into. His older and wiser second in command, Osborne, is known to the troops as “Uncle” and keeps things on an even keel when his superior officer simply can’t. It’s another career best piece of acting, this time from Paul Bettany in a sensitive and compassionate performance. 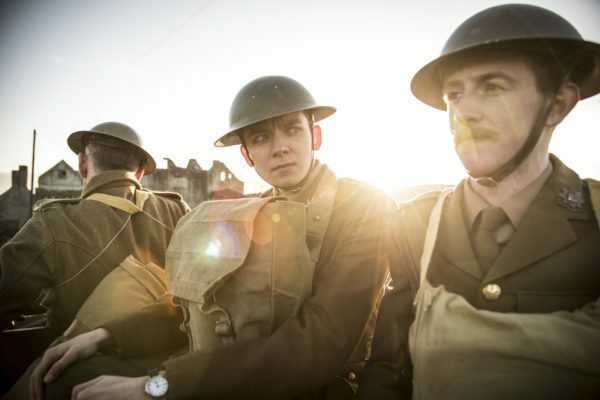 The arrival of new recruit Raleigh (a fresh faced Asa Butterfield) nearly sends Stanhope over the edge: the idealistic young man is the brother of Stanhope’s girlfriend back home and he’s terrified she’ll hear about his behaviour. Keeping the officers fed and on the receiving end of most of Stanhope’s insults – the food he has to prepare is terrible – is Mason (Toby Jones). Most of the time, he emerges out of the shadows with something on a plate and then retreats back into the kitchen – when his polite mask drops. Jones, as ever, is reliably excellent. While those are the star turns, the acting amongst the entire cast is universally high, with the likes of Stephen Graham, Tom Sturridge, Robert Glenister and Miles Jupp all equally impressive. 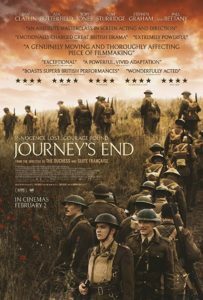 Journey’s End is a powerfully emotional film, one that weighs heavy on your heart and leaves you subdued. The final shot, an aerial view of the battlefield, is full of despair and the captions over the top leave you speechless. What’s happened isn’t just futile, it’s incomprehensible.